Bloominglabs is Indiana's first hackerspace (also known as a makerspace). We are a group of group of people who rent a shared workshop where we can build projects both collectively and individually. Our space is located at 1840 S. Walnut Street. We are open to the public on Wednesday evenings from 7pm until 10pm, and for a trial period, Saturdays from 1pm until 4pm, and are family friendly. 9 What is a hackerspace? We have a public discuss mailing list too. Have you wanted to be able to offer customized knitted things that pertain to local sports teams in your area? Sweater in a weekend? No problem! Machine knitting may be for you. These vintage machines allow you to create customizable knitting projects. 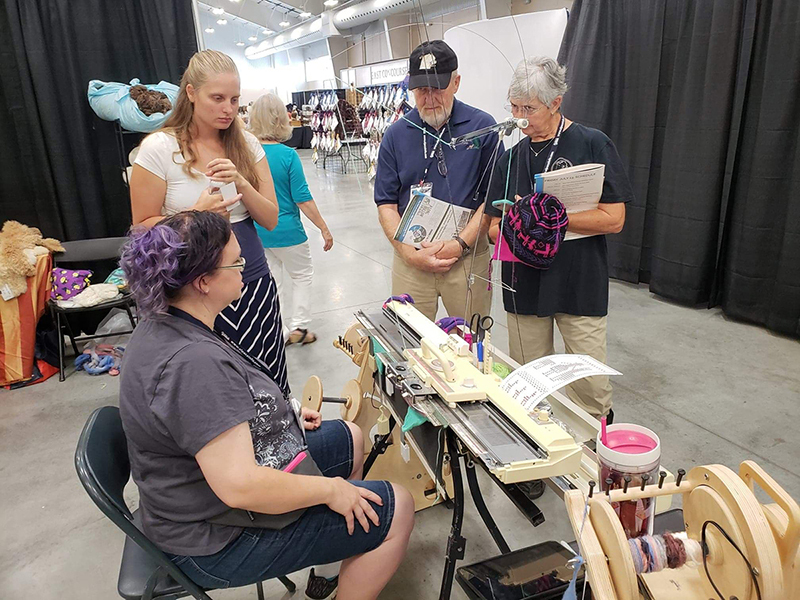 This class will cover everything you need to know to get started with machine knitting and what to look for in a machine. Knitting machines will be available for you to use, and all supplies will be provided. We appreciate donations! However, please bring all donations to Bloominglabs during our Public Hack Meetings (see above). That gives us a chance to decide what of your donation is useful to us. For things we can't use, we'll help you figure out other groups in Bloomington who would appreciate them or help you determine the best way to dispose of them. These are things we are working on, or would like to see, to improve the space. If you are interested in any of these, feel free to work on it! If you are unsure where to start, please get in touch! The page you get when people from the public go to bloominglabs.org has an overwhelming amount of information on it. The New Members page and the Membership Manual should be merged together. In general, it would be great to see more participation in the wiki, especially on the [Projects] page. It might be good to have a page that lists all members with their name, picture, username, email, interests, areas of the space they are familiar with, etc. Currently we meet every Wednesday from 7pm to 10pm and every Saturday from 1pm to 4pm at 1840 S. Walnut Street, Bloomington, Indiana. These meetings are open to the public; anyone is welcome to attend. Having access to tools is only part of the equation. Socializing with people and learning from each other is another large benefit from our group. Pretty much whatever people want to work on or learn is fair game. If it's cool and interesting then we are all interested. This page was last modified on 20 March 2019, at 14:32. This page has been accessed 1,865,355 times.